In order to beneficially apply nutrients contained in animal manure to crops and to protect the environment, it is necessary to calibrate land application equipment. In addition, many states require calibration of manure application equipment on a regular basis via regulations and permitting requirements. Records of calibration results may be a requirement of your permit. Depending on the type of manure or the type of equipment being used to apply manure, there are different calibration procedures to follow. See the following pages for information on specific procedures. Proper calibration of manure application equipment is necessary to insure that field application rates are consistent with nutrient management plans. As nutrient plans have attempted to more accurately balance nutrient supplied by manure and fertilizer and crop requirements, calibration is also critical to avoid under applying nutrients and reducing yields. Manure is a valuable resource that should be applied in an ecological and environmentally sensitive manner. As the value of the nutrients in manure increases due to increases in commercial fertilizer cost, calibration of manure application equipment becomes even more important. Other good reasons to calibrate are to monitor equipment performance changes over time (wear and tear) so that timely maintenance is performed, and to troubleshoot any equipment operational problems. Calibration should be done annually even if regulatory requirements require less frequent calibration. Also, it is a critical to re-calibrate when the consistency or liquid content of the waste changes considerably as changes in material characteristics can change the performance of the application equipment. how uniformly the manure is applied over the field. Some nutrient management plans may be based upon nitrogen limited application, while other will be based on phosphorus limited plans; regardless it is critical to know the amount and uniformity of applied manure. Depending upon the equipment used, calibration will involve field measurement of flow or unloading rates, equipment speed and settings, operating pressure, application width, and application overlap. Application equipment varies depending upon the type of manure, e.g. lagoon liquid, poultry litter, or fresh manure. Calibration of each type of equipment will vary in which measurements are required and how application rate and uniformity are quantified and assessed. Lesson 36 Land Application Equipment from the Livestock and Poultry Environmental Stewardship (LPES) Curriculum offers an overview of the different equipment used to land-apply animal manure and equipment calibration. 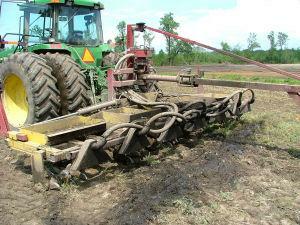 Fertilizer and Land Application Equipment provides a comprehensive review of all types of manure application equipment. It is available for sale through Midwest Plan Service.